Vienna House Easy Bratislava (also known as Hotel Chopin) is located close to the airport and around a 15 minute drive from the city centre (taxis cost between 10-15 Euros). The hotel itself is due to be renovated soon so will have a fresh new look in the not so distant future. The location is perfect for anyone who might stop in Bratislava for a layover for one or two nights due to the proximity to both the airport and the town centre. The hotel rooms were decent sizes with comfy beds and lots of toiletries. On arrival we were greeted by the hotel manager who gave us a gift of local cider and we found handwritten welcome notes in our room which was a lovely touch. The staff also brought us some sparkling water and delicious strawberry cakes which went down well after the long drive to get there. We ordered two half litres of beer from the bar which cost 3 Euros (we didn’t quite believe it either!) and enjoyed them at the restaurant area. The hotel serves food in the evenings as well as a delicious breakfast of hot and cold meats, cereals, eggs, fruit, veggies, breads, yoghurts, hot drinks and fresh juice. The staff at Vienna House were incredibly accommodating, they were able to order us a taxi very quickly and they were able to take a delivery for me which I picked up from reception which was very helpful. I also met with the marketing manager from the hotel who prepared a list of the top spots we should visit during our stay and she was able to answer all of my questions to make the trip efficient and enjoyable. I would highly recommend staying at Vienna House Bratislava, or any other Vienna House hotel as the service we received was absolutely spot on and the hotels themselves are lovely. So now that you know where you’ll be staying, you want to know what there is to do in Bratislava right? A similar place to Prague and Budapest, Bratislava has a range of breweries that create their own beers, which are available in the brewery itself, and most places serve food too. Beer is very cheap (the same price as the beer in Prague) and there are many restaurants serving local and traditional food as well as more common dishes. You can take guided tours around the city and you can also take beer tours and beer bikes around just like you can in Prague or Budapest to see some sights and sample some beers. Standing proud on the hill overlooking Bratislava and the Danube River is Bratislava Castle, which on a clear day also has views over Austria and Hungary. The castle features in the oldest written reference to the city of Bratislava in 907 AD and houses collections from the Slovak National Museum. Bratislava Castle is open to the public from 10am until 6pm Tuesday – Sunday. Bratislava’s Old Town is full of charming buildings and quiet narrow streets and is a delight to explore. There are many gorgeous and intricately detailed buildings that are now concert halls and museums that are worth checking out and the Old Town Hall (pictured) has a history dating back to mediaeval times. There are many gorgeous cafes, restaurants and bars in this area, along with places to pick up food on-the-go if you’re in a bit of a rush to fit everything in! Whilst in the Old Town, don’t miss out on seeing Michael’s Gate. The tower is gothic in design and stands at 51 metres tall, allowing visitors to get a great view over the whole of the Old Town. There is a plate listing the distance of 29 world capital cities from Bratislava on the street that passes through the gate. Bratislava is also home to many different metal statues. You’ll find a lot of these dotted around the Old Town and they’re a popular photo spot with the tourists. My favourite statue was of a man cheekily climbing out of a man hole. The Blue Church is a pretty art-nouveau style building which, as the name suggests, is entirely blue. Sky blue in fact. The church was built in the early part of the 20th century and the roof tiles, the mosaics, the walls, even the interior – everything – is blue. The church is surrounded by pretty green trees which makes the place feel like it’s been lifted straight from the set of a Disney film and cements itself as one of the top sights in Bratislava. The church’s official name is the Church of St Elizabeth of Hungary but it is more commonly known simply as the Blue Church. Bratislava hadn’t always been on our itinerary when we planned to travel around Europe so we were very grateful to Vienna House for giving us a chance to see the city which left us very pleasantly surprised. 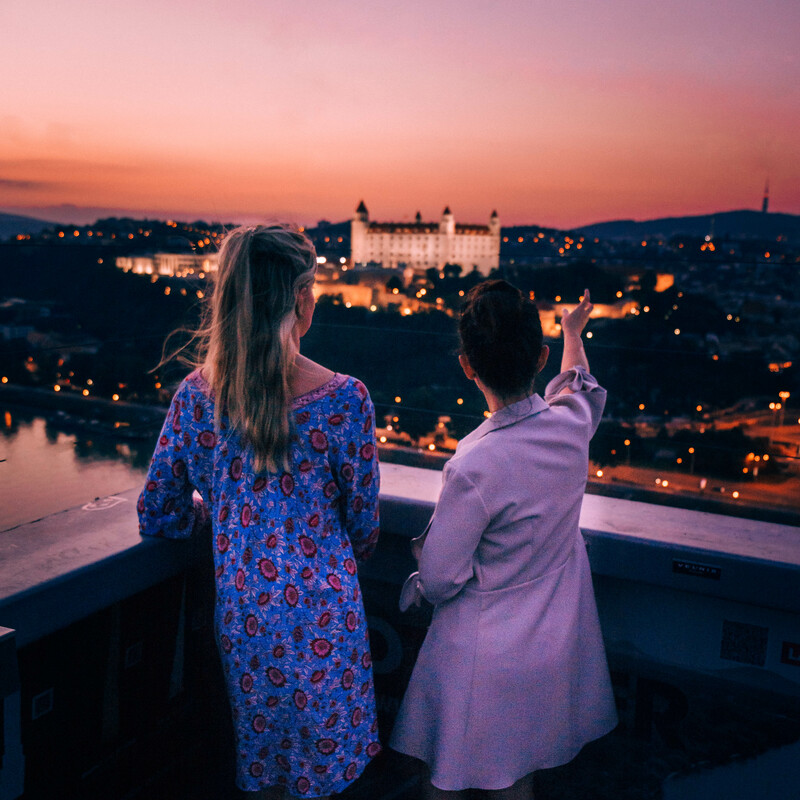 I truly believe that you should add Slovakia and Bratislava to your bucket list or stop there for a few days on your next trip to central Europe – you won’t regret it!